Chester Marston celebrated his 91st birthday Jan. 16, 2011, with lunch at the home of his granddaughter, Abby, and her husband, John Gray, of Georgetown. The Owen County Clerk’s Office requires proof of registration for all transactions. If you don’t have it, a $3-fee will be charged for registration. Following a proclamation made by Owen County Judge-executive Carolyn Keith, all citizens are urged to honor local school board members throughout the month of January. On Jan. 11, the Owen County Fiscal Court held its first regular meeting of the year, where Keith signed a proclamation honoring the members of the Owen County Board of Education during the 2011 observance of School Board Member Recognition Month. 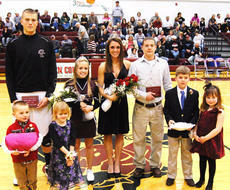 Friday, Owen County High School students named their 2010-11 basketball homecoming king, queen and court. Pictured are (from left) Malachi Mefford, Abigail Lawson, homecoming prince Sawyer Williams, homecoming princess Ashley Smith, homecoming queen Danielle Hoop, homecoming king Brian Widner, Isaac Wash and Rayna Taylor. Local law enforcement vehicles lined West Seminary and North Main Streets Monday in honor of a former Owen County Sheriff’s Office dispatcher. Marvin C. Ogden, a lifelong resident of Owen County, died Jan. 6. Ogden was born in 1918 and was a member of Owenton First Baptist Church where he served as a former deacon. 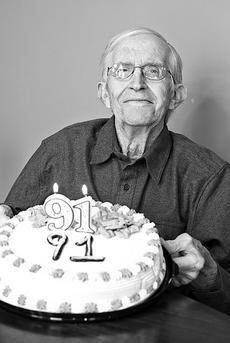 A 75-year member of the local Oddfellows Lodge No. 213, Ogden was the longest living member in Kentucky. Ogden also served in World War II, where he earned a Purple Heart. Because of snow days last week, the Owen County Adult Learning Center was unable to offer the previously scheduled official GED practice test. The test will be offered again Jan. 31 and Feb. 2. Interested parties should contact the Adult Learning Center at 484-0405 by Jan. 27. The Jan. 27 GED test has been rescheduled for Feb. 17. For more information contact the Adult Learning Center at 484-0405. During its first meeting of the new year, the Owen County Fiscal Court made several re-appointments and set pay for some employees. The court met Monday for a special called meeting. Pam Miller was re-appointed to her position as deputy county judge-executive. A resolution was approved clarifying what duties and responsibilities the deputy judge-executive can take over in the event that the county judge-executive cannot fulfill those duties. Owen County Treasurer Norma McDonald was also re-appointed to her position, which will end July 1. The Owen County School District will join public school systems across Kentucky in honoring a group of local leaders during the January observation of School Board Member Recognition Month. Terry Patterson, Brett McDonald, Stuart Bowling, Bryan Young and Larry Johnson are important players in the ongoing quest to ensure the students in Owen County schools receive the highest-possible quality of learning experiences from innovative teachers in safe and efficiently managed schools. Bowling has served the longest. He has been on the board since 1993. Is one of your New Year’s resolutions going to be getting your finances in order? By the end of the month, do you wonder where your money has gone? Does it always feel as if there’s too much month left at the end of your money? If the answer to any of these questions is “Yes,” then it’s time to bring your checkbook back into control by attending Financial Peace University. Kentucky-American Water customers will see an increase in their monthly bill after the Kentucky Public Service Commission approved a rate increase for the utility. Although Kentucky-American had sought a rate increase of three-fourths, the commission allowed a hike of about 29 percent for the average customers using 5,000 gallons of water a month. For the customer using that amount of water, the bill will increase from $27.46 to $35.40. The company argued it needed the increase to cover the cost of the recently opened water-treatment plant in Owen County which feeds Fayette County.